Photo: Mike CameronDirect Resolution may be a new name to most SOS readers, but as a company they have been quietly specifying and building computer systems to suit the special needs of the professional recording studio for some time. They also offer a wider range of audio interfaces than some competitors, including such options as Lynx, Pro Tools and Soundscape, and they champion sequencers such as Magix' Samplitude and Cockos' Reaper, as well as the more usual Cubase, Nuendo, and Sonar. Although you can buy Direct Resolution's audio PCs with tower or micro cases, I suspect most musicians will opt for the one used in this review system — an X-Case 4U rackmount case with added acoustic treatment. For me, the best feature of this case is its lockable door. It has acoustic foam mounted behind it, and once the door is closed you can scarcely hear the remaining noise of the internal cooling fans or hard drives. This is the weak area of most other case designs as far as acoustic noise is concerned. Case: X-Case Compucase S401 19-inch 4U rackmount case with acoustic treatment fitted as standard, plus two upgraded hard disk enclosures. Motherboard: Asus P5BE with one Socket LGA775 (for Intel Core 2 Quad/Extreme/Duo, Pentium Extreme, Pentium 4 Extreme, Pentium D or Pentium 4 processor), Intel P965 chip set, four DIMM sockets supporting up to 8GB of system memory, three PCIe x1 slots, one PCIe x16 graphics slot and two PCI 2.2 slots. Processor: Intel Core 2 Quad Q6600 with 2.4GHz clock speed and 8MB cache. CPU heatsink and fan: Silverstone Nitrogon SSTNT06 V2 with 120mm fan. System RAM: 2GB (2 x 1GB) Corsair TwinX XMS2 667MHz. System drive: Samsung HD080HJ 80GB, 7200rpm, SATA II, 8MB buffer. Audio drive: Samsung Spinpoint SP2504C 250GB, 7200rpm, SATA II, 8MB buffer. Sample drive: Samsung Spinpoint SP2504C 250GB, 7200rpm, SATA II, 8MB buffer. Graphics card: Gigabyte 7100GS graphics card with passive cooling. Optical drive: Samsung SH-S182D DVDRW. Active system ports: PS/2 mouse and keyboard, four USB 2 ports on rear panel plus two more on front panel (four additional ports available on motherboard headers), one rear-panel Firewire 400 port (plus one additional header on motherboard), Gigabit LAN port. Installed Operating System: Windows XP Home. The Direct Resolution range encompasses both AMD and Intel processors, and starts at a very reasonable £799. 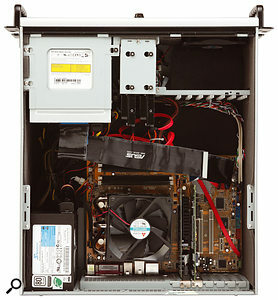 The system under review here is the Studio Plus, based around Intel's Quad-core Q6600 processor running at 2.4GHz, cooled with a Nitrogon heat-pipe assembly and a quiet 120mm fan. The P5BE motherboard is from well-respected company Asus, and was one of the models on my own DIY shortlist when building a dual-core PC some months back. This motherboard features a good complement of three PCIe x1 slots for future expansion, a single PCIe x16 slot housing (in this system), a modest Gigabyte 7100GS graphics card with passive cooling to keep noise levels down, plus a generous three PCI 2.2 slots for 'legacy' cards, one of which had been used on this particular system to install the Lynx Two audio interface. On the back panel we have the usual connections you'd expect to find on a PC along with three PCIe x1 slots, a single PCIe x16 for the graphics card and three PCI 2.2 slots for 'legacy' cards — one of which has been used here for the Lynx Two audio interface.Photo: Mike CameronIn fact, 'well-respected' seems to sum up the component choice in this machine, which is fitted with 2GB of high quality Corsair RAM, plus a total of four quiet Samsung hard drives. In a departure from the norm, the 80GB system drive and 250GB audio drives were supplemented in the review system by an additional 250GB drive intended for sample storage and streaming. This, to my mind, is more useful to most musicians than the more typical twin-drive audio RAID 0 setup, but of course you can specify whichever drive combination you feel best suits your particular style of music-making. The cooling arrangements are completed by a front-panel-mounted 120mm fan to pull cool air into the rack, while the 500W Seasonic PSU also features its own 120mm cooling fan. Meanwhile, to cut down on noise, all three hard drives are 'soft' mounted to decouple their vibrations from the rest of the case, and the entire case is lined internally with acoustic foam of varying thicknesses to both stop the case panels 'ringing' and prevent any remaining internal noise from escaping. Direct Resolution systems also include a nice collection of bundled software that's rather different from the norm, containing the Magix Samplitude SE sequencer (supporting up to 48 audio tracks), Lounge Lizard Session or Ultra Analogue Session soft synths from Applied Acoustics Systems, FXpansion's BFD Ultralite, with nearly 600MB of drum samples, plus two very tasty plug-ins — Tritone Digital's Valvetone EQ and Acustica Audio's Nebula 3DR processor emulation plug-in (a special version compiled for Direct Resolution, containing a total of 44 presets that cover preamps, reverbs, filters, EQs, mics, hardware and tape compression, and chorus, phaser and wah-wah effects). As with other specialist system builders you can specify your choice of audio interface, and Direct Resolution are also happy to fit your existing audio interface and install your existing sequencer application free of charge if you send it to them. All Direct Resolution computers provide a minimum of one year Return To Base warranty (with Direct Resolution Ultimate systems this is increased to two years), while most parts have a three-year warranty. All systems benefit from lifetime free technical support and advice by telephone or email. This last item is especially noteworthy, as many companies charge for support after the first few months. The first test for any audio computer is how noisy it is when switched on, and this system passed with flying colours! The Studio Plus is the quietest rackmount system I've reviewed to date, and the quietest of any production model not using the considerably more expensive PaQ case. As always, noise and temperature are closely related, and while idling temperatures of the four cores were perfectly acceptable at 54 degrees centigrade, when I ran my Prime95 torture tests the resulting 75 degrees centigrade was higher than I'd like. Although not dangerous, I think the CPU fan should ideally have its speed increased to bring this down to somewhere in the 60s, albeit at the expense of a slight increase in acoustic noise levels. The Blofeld's DSP40 benchmark results for the Studio Plus Q6600 quad-core 2.4GHz are identical to those of Rain Recording's Nimbus (featuring the same processor), offering up to a 100 percent improvement across a range of buffer sizes over a dual-core running at the same clock speed. The quad-core CPU will also run down to tiny buffer sizes such as 32 samples, if required.Photo: Mike CameronThe parallel and serial ports and the High Definition audio soundchip had all been disabled in the BIOS, and while the Audio and Samples hard drives had each been formatted as one large NTFS partition, the system drive had been sensibly divided into 34GB System, 34GB Data, and 6GB devoted to page-file usage. A quick check on Windows tweaks showed that all the important tweaks had been implemented. I was a little surprised that all the Visual Effects were still enabled, but nowadays these only make a marginal difference. Next I moved into some benchmark testing. Sisoftware's Sandra's results for memory bandwidth, CPU Arithmetic and Multimedia were, as I expected, almost identical to those of Rain Recording's Nimbus system (reviewed in SOS July 2007) with an identical processor and RAM type, but running Windows Vista instead of XP (the CPU Arithmetic and Multimedia benchmarks were almost exactly double those of my PC, which runs two 2.4GHz cores instead of the four of the review PC). Moving on to audio-specific tests, I started with the now-elderly Fivetowers test (which runs lots of plug-ins and VST Instruments inside Cubase, but very few audio tracks) and more punishing Thonex test (no audio tracks at all, but lots more VST instruments and plug-ins), and was interested to note that both produced results across various different audio interface buffer sizes in Windows XP that were identical to the Rain Recording PC Vista results. The Thonex results showed no more than a 30 percent drop in Cubase CPU meter reading compared with a similarly clocked dual-core PC. This does tie in with other published tests that indicate little difference between XP and Vista at buffer sizes down to about 128 samples, although Vista drops further and further behind at lower buffer sizes, particularly when running lots of soft synths. Finally, I performed the more intensive Blofelds DSP40 test (this time with a more real-world combination of a few VST instruments and 40 audio tracks, each with an EQ and compressor plug-in, plus one or more Magneto plug-ins added to each track until the PC runs out of processor power). 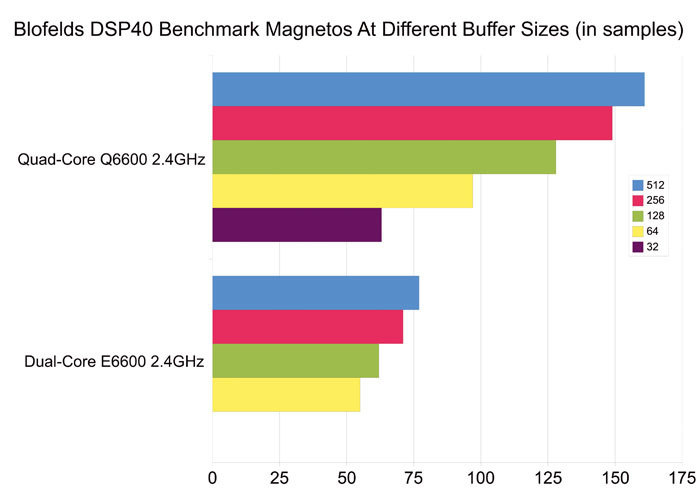 This showed much more encouraging results, with the quad-core Q6600 logging just over double the number of Magneto plug-ins that my own E6600 dual-core PC managed, running at the same clock speed (for instance, 161 compared with 77 at a buffer size of 512 samples). This proves the importance of choosing the most suitable benchmark! Looking inside the case we can see some of the pipes for the nitrogen-based cooling system, as well as some of the acoustic foam that helps to make the Studio Plus so quiet.Photo: Mike CameronMy measurements of both the Rain Recording and Studio Plus PCs now confirm that, whatever the OS, a quad-core PC seems to outperform a similarly clocked dual-core PC by up to 100 percent with the Blofelds DSP40 test. It's amazing that you can now buy a quad-core processor for around £175, and a quiet and well-featured audio PC like this one, featuring a Q6600, for a little over £1000! Ironically, Intel's new E6850 dual-core 3.0GHz processor is now available for the same price as the Q6600 quad-core 2.4GHz, and since games have only just been updated to take advantage of dual-core processors, and rarely show any performance improvement with quad-core versions, the E6850 would probably be the best choice for gamers. However, of the two, the Q6600 quad-core used in this Studio Plus system is a far better choice for the musician, so it's hardly surprising that many DAW builders are featuring the Q6600 in their latest systems. We've seen a colossal increase in PC processing power over the last year or so, and this Direct Resolution Studio Plus system offers extremely good performance for the price, as well as being noticeably quieter than any production PC I've reviewed over the last couple of years. Bearing in mind also the attractive 'analogue'-style rackmount case and free lifetime support, I suspect that Direct Resolution are going to have many happy customers! The joint-fastest PC reviewed in SOS to date! 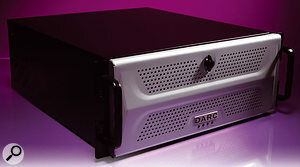 Attractive and robust rackmount case. CPU ran rather hot during torture tests. Not all audio applications may take advantage of all four processing cores. This Studio Plus PC provides extremely good performance with lower acoustic noise and a lower price than some of its competitors, while the combination of an attractive rackmount case and free lifetime technical support should also prove very popular! Studio Plus system as reviewed, £1299 including VAT. Direct Resolution +44 (0)1209 831499.